The Lake District’s landscape is a patchwork of habitats. Our meadows and peatlands add to the diversity of plants and wildlife we find here, but need our help to be restored back to their former glory. Cumbria Wildlife Trust works with farmers and small holders to enhance, restore and manage flower-rich hay meadows in the area, using traditional practices to increase plant diversity. 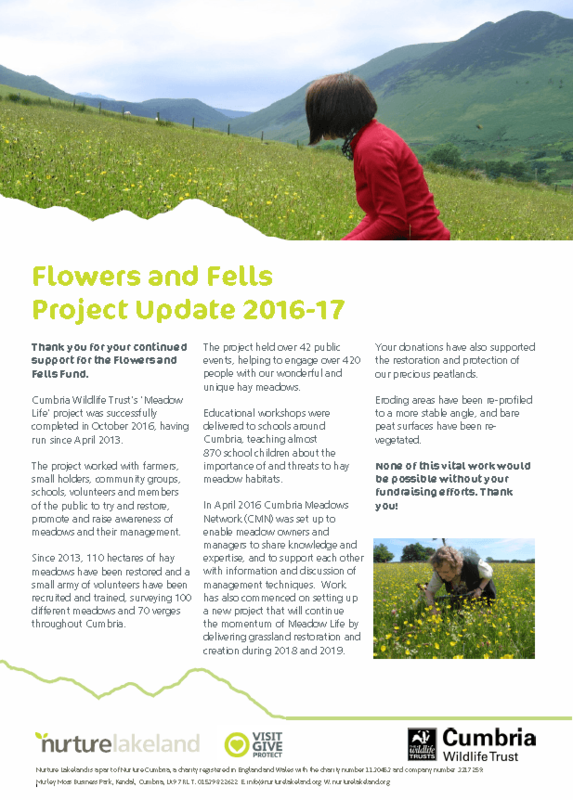 They also promote the landscape of hay meadows through events, educational workshops, walks and talks. Hay meadows are important for the plants they support. A hay meadow can support an incredible 50 plant species/sq. metre! Traditional meadows are still found in Cumbria, where higher altitude meadows support specialist plants species, such as wood crane’s-bill and many of the lady’s mantle species, and lowland meadows, are characterised by a rich diversity of more common plant species. Such a wealth of plant species can in turn provide habitats for many different animal species including the brown hare, insects such as the great yellow bumble bee, and birds such as skylark, curlew, lapwing and twite. Cumbria Wildlife Trust is also helping protect wetlands across Cumbria, demonstrating new restoration techniques and building partnerships to protect Cumbria’s peatlands. The project is working on a wide range of important wetland habitats including fens, blanket bog and lowland raised mire. The majority of these habitats occur on relatively deep peat soils which are collectively known as peatlands … but these peatlands urgently need careful management to reverse the damage caused by drainage, heavy grazing, regular burning, cultivation, forestry and other management. Peatlands are the UK’s largest carbon store – with 28.5 million tonnes in the Lake District alone. Our damaged peatlands are decomposing, releasing carbon dioxide back into the atmosphere. Water quality and drinking water. 70 per cent of UK drinking water is from upland (generally peat dominated) catchments. If the Sphagnum moss is damaged, the surface dries, crumbles and cracks in summer; later rapidly eroding during severe weather. Blocking drains slows run-off, whilst wetlands in valleys store floodwater. Peat has preserved remarkable ancient graves and wooden artefacts that haven’t survived elsewhere. Fascinating specialist species including carnivorous plants have adapted to the harsh peatland environment. Many have population strongholds in Cumbria. The most threatened species depend on the wettest bogs or need large areas of continuous habitat.